The paintbrush tool paints fuzzy brush strokes. All strokes are rendered using the current brush. 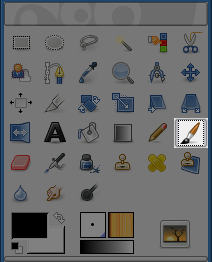 You can call the Paintbrush Tool in the following order, from the image-menu: Tools → Paint Tools → Paintbrush. or by using the P keyboard shortcut. This key changes the paintbrush to a Color Picker. This key places the paintbrush into straight line mode. Holding Shift while clicking Button 1 will generate a straight line. Consecutive clicks will continue drawing straight lines that originate from the end of the last line.